Most plants of estuary mudflats and saltmarshes are remarkable only for their ability to tolerate such harsh, salty environments but quite unremarkable in terms of floral beauty. 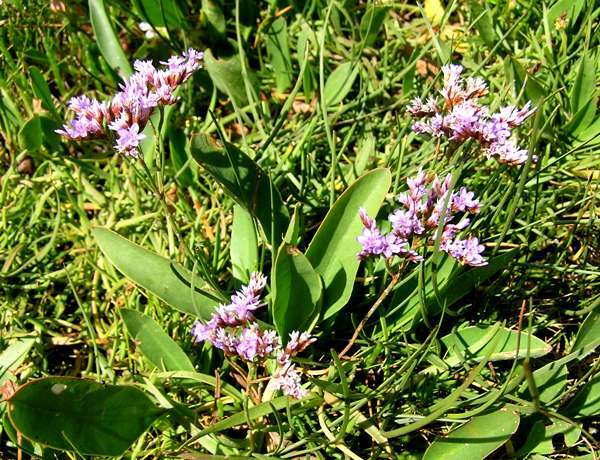 Sea-lavender, sometimes referred to as Common Sea-lavender, is a notable exception. Growing to 30cm in height, Limonium vulgare is a hairless perennial with oblong to spoon-shaped blunt pinnately-veined leaves and lavender-lilac or pink-mauve flowers. Flowers are borne on branched corymbs or panicles on leafless curved scapes, each branch bearing two or three flowers. The spikes are spreading and often curved backwards. The calyx and corolla of the flower each form a five-segmented tube, and the typical length of a flower is 7mm. 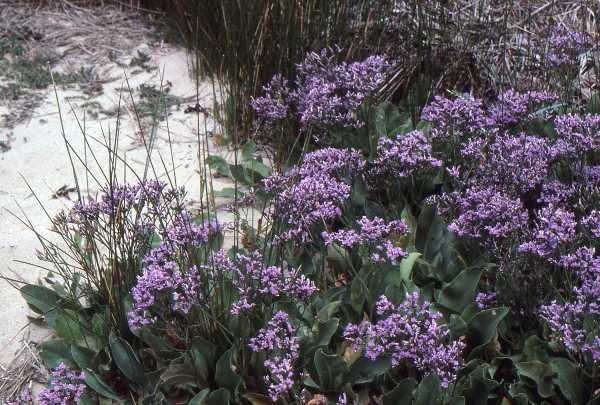 In England, Wales, Ireland and southern Scotland Sea-lavender can be found in low-lying saline marshes and muddy estuaries at many sites distributed around much but not all of the coast. This species occurs throughout the coastal fringes of western and southern Europe as well as along the coast of North Africa. There are records of Limonium vulgare occurring in a few places in the USA and Canada, where it is considered to be an introduced wildflower. 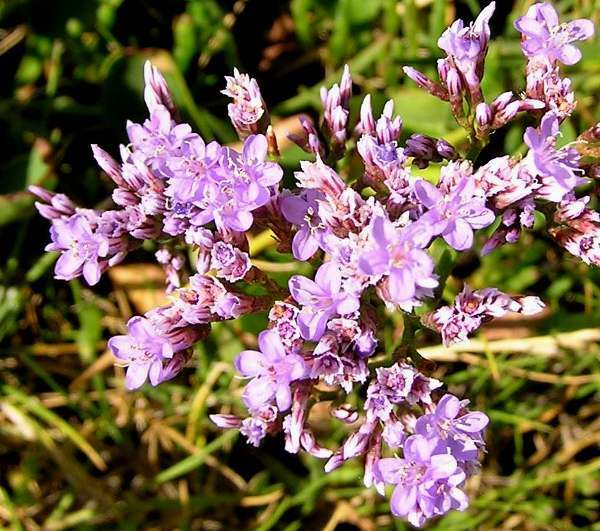 Sea-lavender is a salt-loving plant and thrives is saltmarshes and on the edges of runnels through mudflats in estuaries. 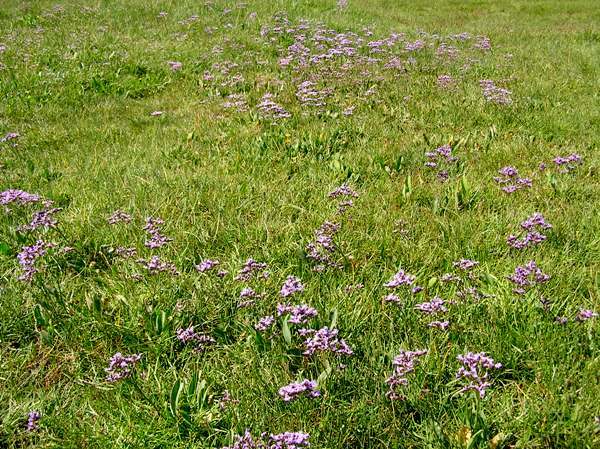 Where prevailing winds drift salt spray towards the shore, Sea-lavender can also be found in grasslands some distance from the shoreline. In Britain and Ireland Sea-lavender can be seen in bloom between early July and late October, but it is generally at its finest during the month of August. Flower spikes of Sea-lavender are popular for use in dried-flower arrangements, because the flowers hold their shape and their deep lilac colour lasts for many months before fading. Limonium, the generic name of sea-lavenders, means 'of a moist meadow' - a reference perhaps to the fact that Sea-lavender favours open wet areas in full sunlight. The specific epithet vulgare translates to common. Some 100 or more Limonium species occur in Europe as well as many subspecies and varieties. Most of these are found in the Mediterranean region - Limonium sinuatum and Limonium recurvum are two such examples - with just a few species extending into northern Europe.